We assumed when we left London at the beginning of February, we’d left the only cold we’d see all trip behind as well. When we mapped out our flights, we planned to be in the Middle East in February and early March so we could miss the cold creeping out of the Northern Hemisphere. 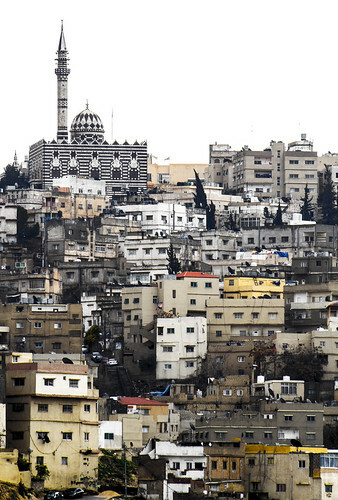 We assumed it would be warm in February in Dubai, Jordan, and Israel. You know what they say about assumptions and in our case it’s true. This is the story of how misperception can frost bite you in the arse. 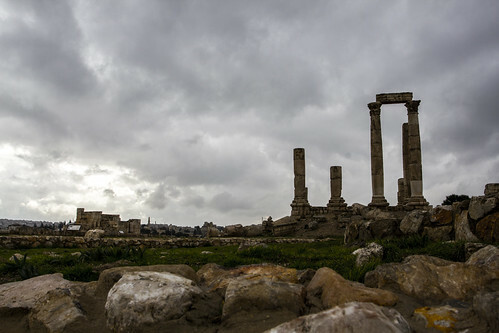 We landed in Amman, Jordan on February 17th. We’d booked two night’s at Genny Bed & Breakfast. It was one of those places where we felt the hosts took pity on our ragged selves, tending to our comfort as if we were their kids, but they were probably just good hosts. We ended up staying three nights on the outset and made sure to stop in for one more before heading out. It was 50 degrees Fahrenheit when we arrived. The moment we pulled up to Genny’s, rain hit and the mercury sank. It snowed twice while we were there. When we asked people if this was normal, we got a consistent response, “Well not really. But it is February,” whatever that means. We pose for a parent’s picture on top of the Citadel. I know that smile doesn’t say cold but the eyes do. We spent some time exploring all that the Citadel had to offer. I can’t remember how much time, but it was long enough for the chill to get so thoroughly in my bones that I begged Nellu to leave and find some place warm. But that was part of the problem in Jordan. Internal heat doesn’t exist in most of the buildings. 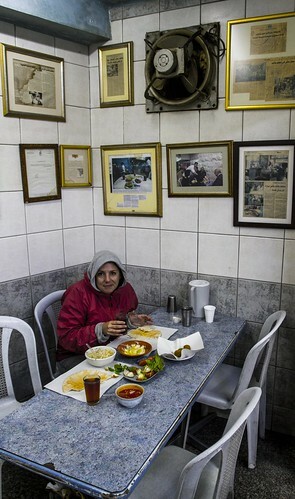 We were able to find shelter and yummy food at Hashem’s at the foot of the Citadel but most of the famous eatery was open air. 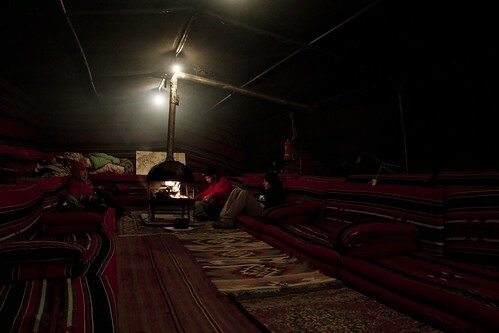 We headed to the back corner but the only heat we found came from our hot mint tea. The issue that I had with Petra – or more specifically with Wadi Musa, the town that serves as an entrance to the site – was the lack of heat. 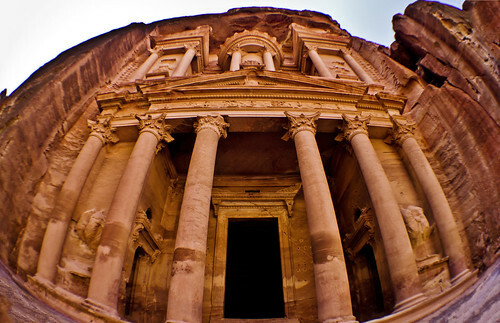 We planned to spend three days exploring the area: the first two roaming around Petra and staying at a hostel in town, and the third day we’d check out “Little Petra” and sleep at a the Seven Wonders Bedouin Camp just a few kilometers away. The weather when we arrived was warm during the day. 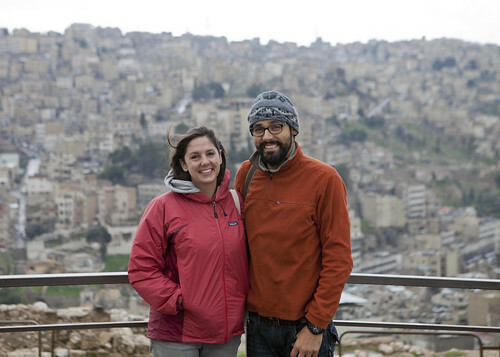 We shed layers as we toured Petra, climbing up to lookouts and rambling down hillsides. Before the sun went down, we headed back to our hostel. It was cold in our room so we climbed under the thick stack of blankets on our bed. The hostel did have heat but they only turned it on between 6am and 9am in the morning and 6pm and 9pm at night. Oh but thank goodness for Genny’s! After a three and a half hour bus ride and short cab ride back to Amman the next day, I washed and dried the smoked-meat smell right out of my hair. It was wonderful moment for me. The first thing that comes to mind when one thinks about Dubai is certainly not budget travel. This Emirate made its name with its bigger-the-better-no-luxury-spared attitude (that ultimately led to a $10 billion bailout from its neighbor Abu Dhabi). But I had covered this rise and stumble at my old job and wanted to take in the place with my own eyes. And that’s exactly what we did. Nellu and I spent the four days we were there primarily gawking at buildings. It was truly a spectacular sight in person. The way the intense desert sun reflects on the glass and metallic structure makes it seem more fitting for Lex Luthor’s lair in a Superman movie than the homes, offices, and hotel it houses in real life. 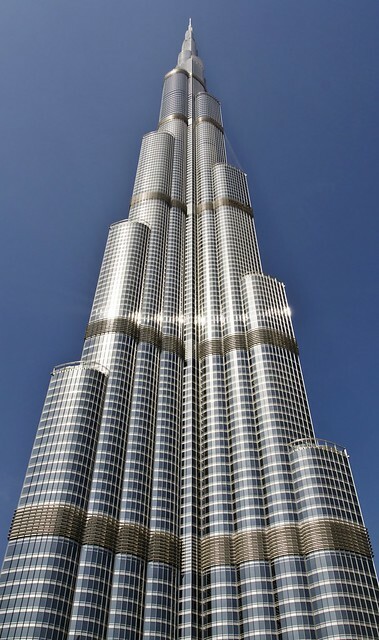 We went to visit the Burj Khalifa twice. The first time was the morning we arrived in Dubai. The second time, we went at night to see fountain show in the moat that surrounds the building and take the elevator to the 124th floor observation deck. Over the last year, I’ve come to believe that water and light shows are all over-rated, but the one outside the Burj Khalifa did deliver. 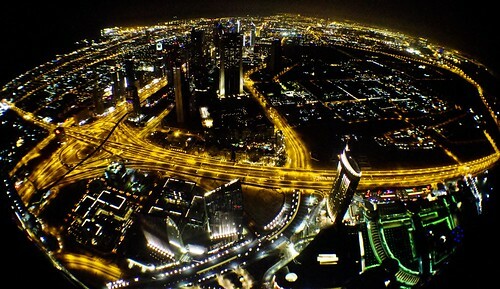 We also had fun taking pictures from so high above the flat night landscape. But my favorite thing about the Burj Khalifa is the complete lack of irony its marketing team has when it touts the greatness and the achievement of building a really tall building. The phrase, “The word impossible is not in the leaders’ dictionaries,” greets visitors waiting to go up to the top deck. 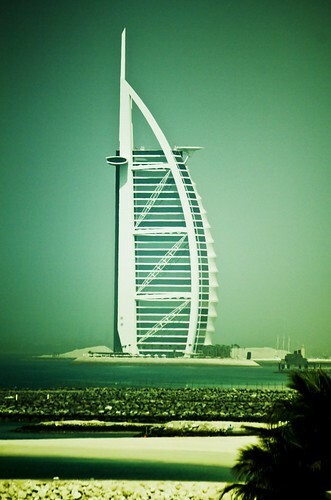 The other must see building for me in Dubai was the Burj Al Arab. My favorite Burj Al Arab photo by Nellu. It’s Dubai’s hotel that looks like a sail. Interesting side note, a friend told me that advertisers aren’t allowed to photo the building from the sea because the long perpendicular restaurant near the top forms a cross against the building’s tall pillar. 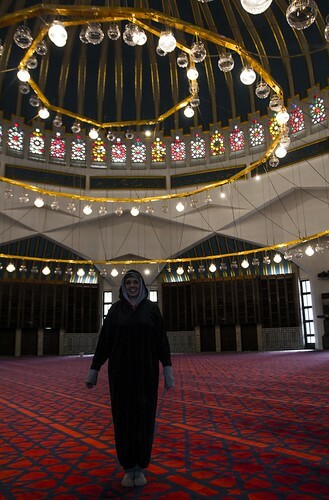 There is much debate on the web whether or not this was done intentionally – placing a Christian symbol on an iconic building in a Muslim nation. Also apparently an urban myth is the claim that the Burj Al Arab is the only seven-star hotel in the world. Wikipedia entries (and you know everything you read on Wikipedia is true) report none of the star rating systems actually go above five stars. You can’t go visit the Burj Al Arab unless you’re staying there or you have a reservation at one of the hotel’s restaurants. You can make a reservation at the Skyview Bar for a minimum spend of about $60 a person but Nellu and I instead tried to get as close as we could without a meal commitment. We made it as close at the hotel next door. They were less than thrilled when I tried to inch my way closer by going through the staff area outside. One of the things I said we’d do on this trip was sneak into a hotel pool. It would have made a good story if that pool just happened to be at the Burj Al Arab (note to self). Ok, I must admit, we’re home and we have been for about a week and a half. And before that we were visiting friends from Germany to Ireland so that’s why these posts have become few and far between and there hasn’t been anything new for almost a month. Wow, have I been slacking off! We’ve got so many more stories, photos, and videos to share. I just have to get motivated and I promise if you stick with me I will.